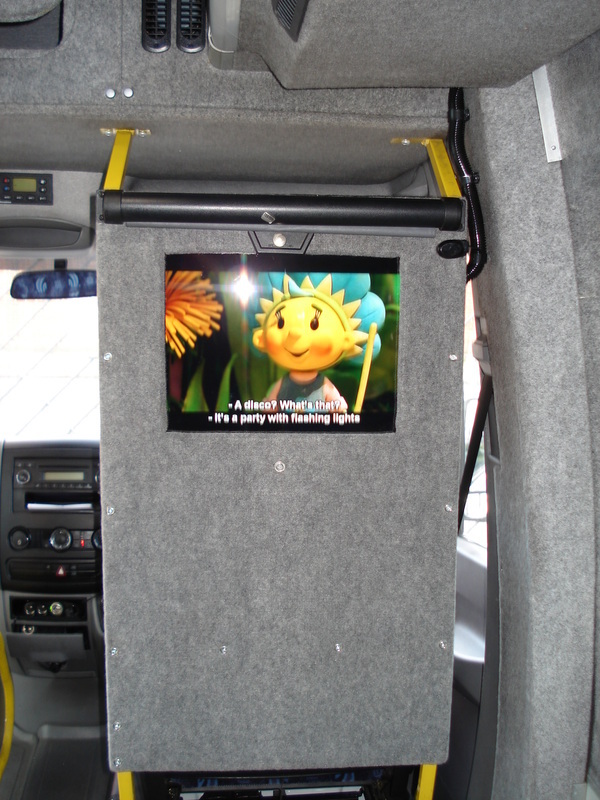 DVD & 15 Inch LCD Monitor into Mobility Mini Buses. 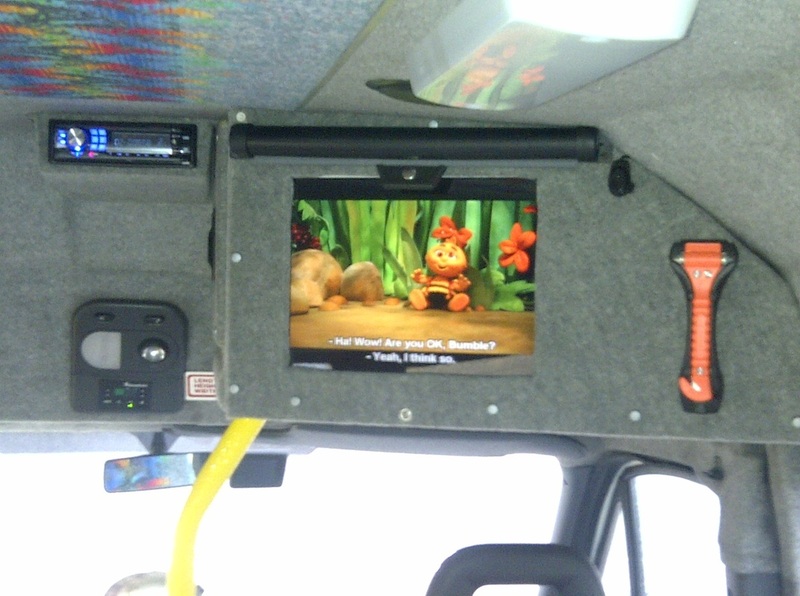 Our customer contacted us to design and install a custom DVD and Monitor System into various different vehicles of their fleet, for the children to watch whilst they transport them between home, school and various destinations. 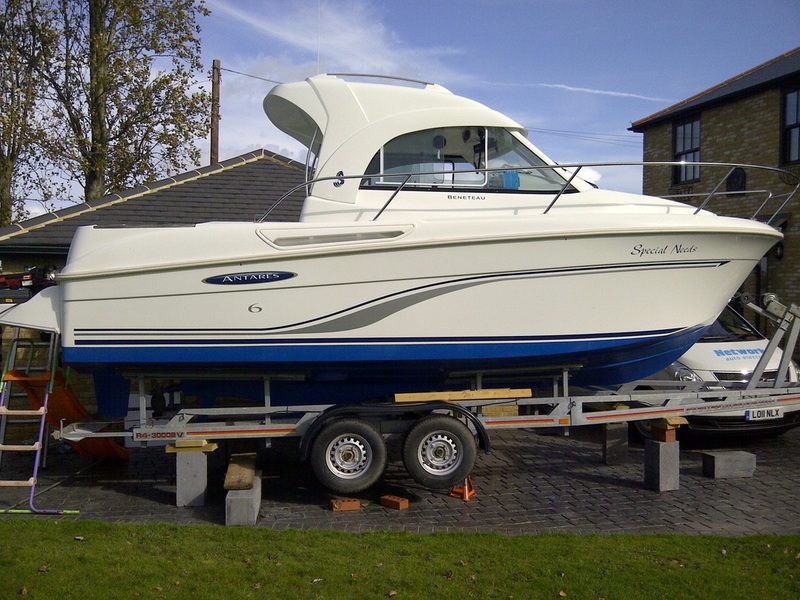 On completion our customer was delighted with the end result. Lets hope the children love them too!! 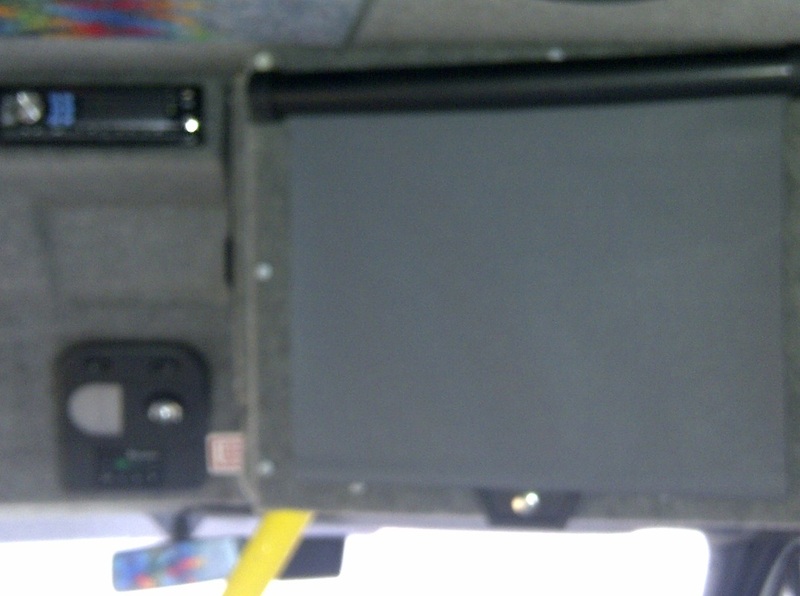 15 Inch LCD Monitor into Mercedes Sprinter Mobility Bus. 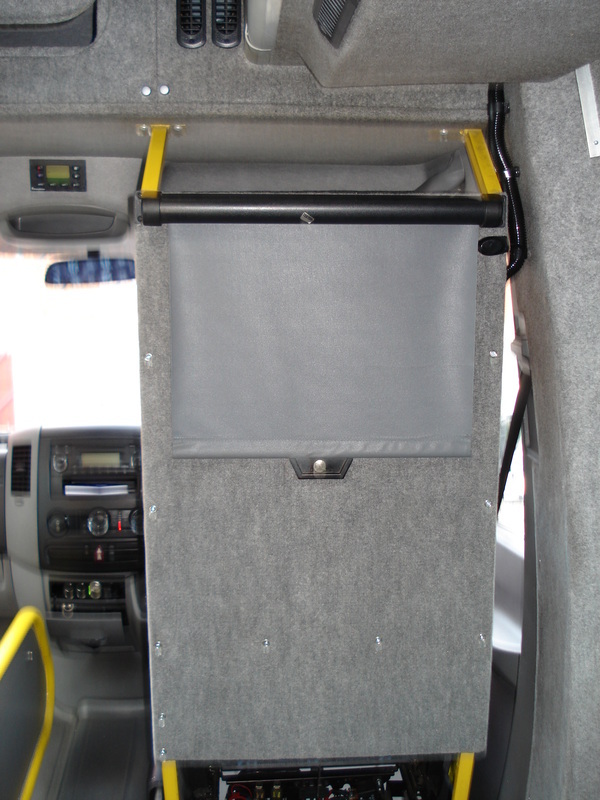 15 inch LCD Monitor and DVD Player into Iveco Mobility Bus. 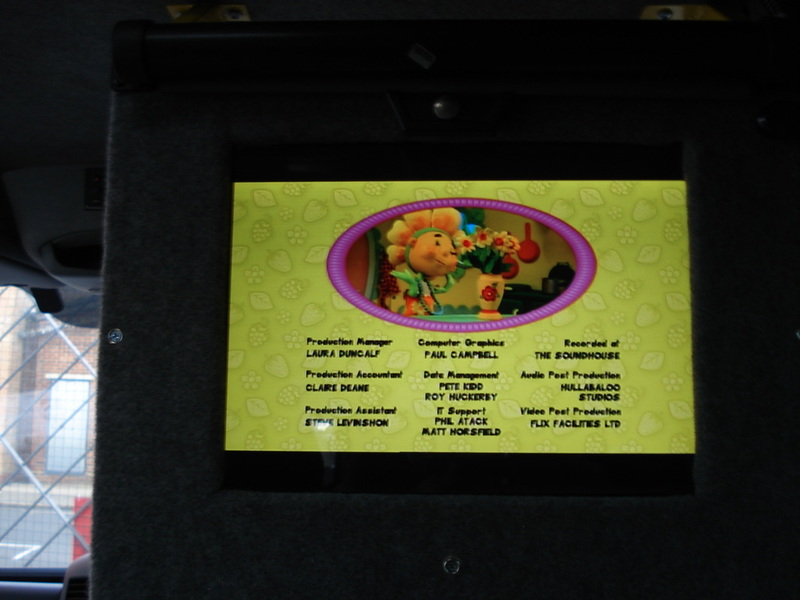 DVD Player Fitted in Overhead Locker. When not in use Blind Covers the Monitor. lighting draws. On average you can save between 50-75% of the power used compared with normal bulbs or fluorescent lighting. 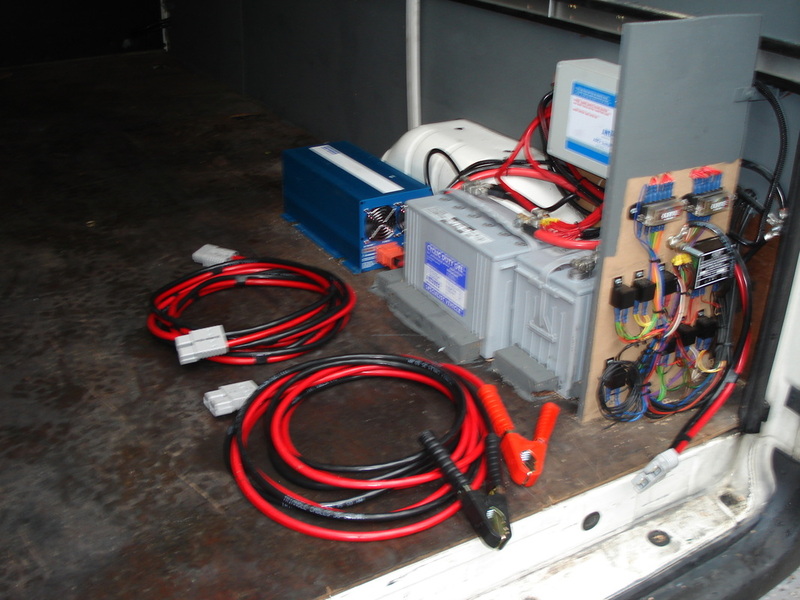 This all means you can use them longer (as they have a longer working life) without draining the vehicle or auxiliary battery. 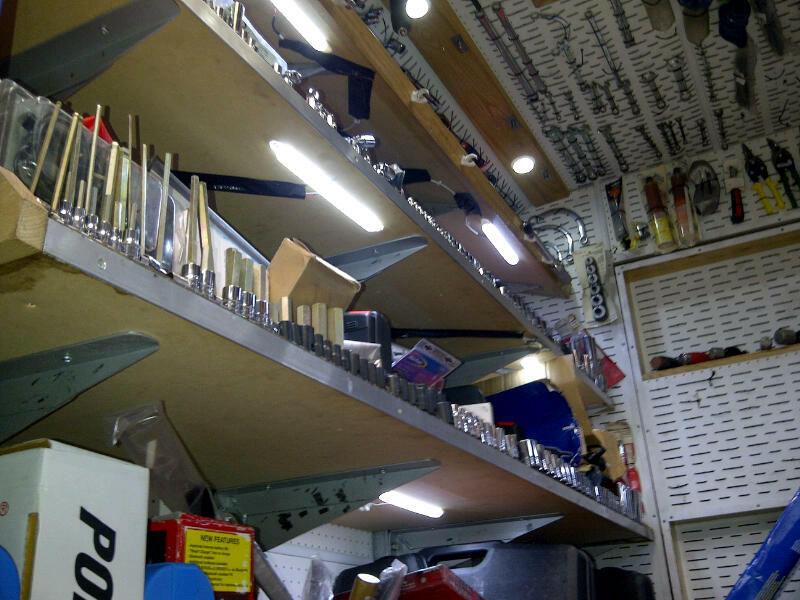 Below are some examples of LED light installations. 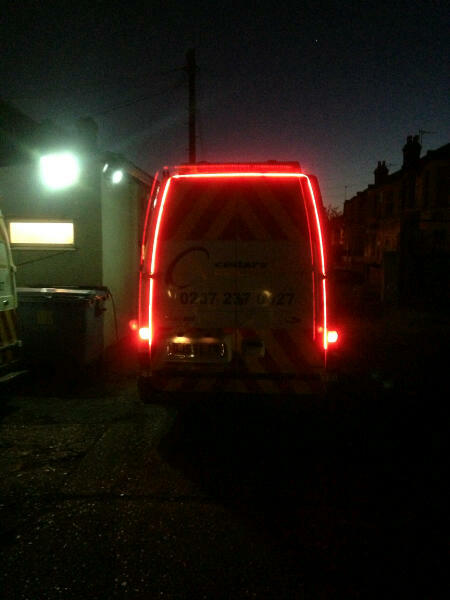 The Driver of this Service Van wanted a better lighting option, as he wanted to be seen whilst working on the hard shoulder during the dark winter nights etc. 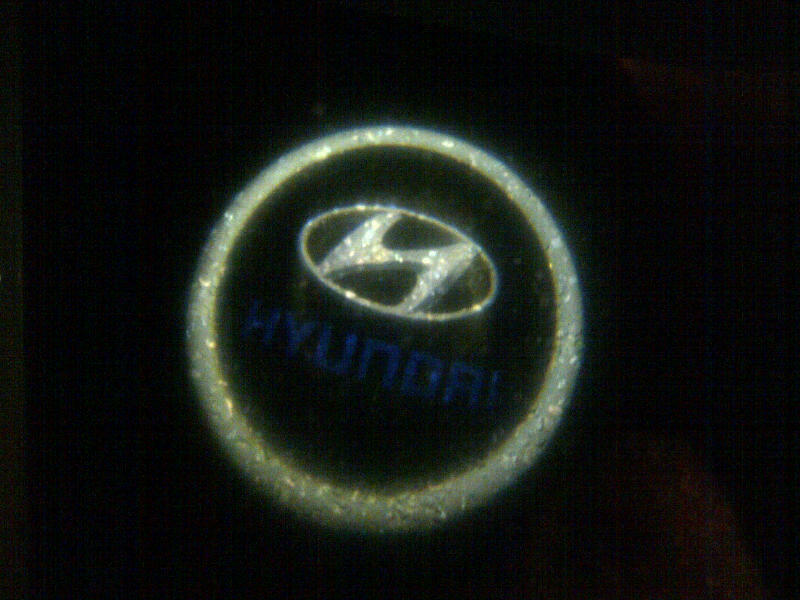 LED Puddle Lighting, shines on the ground and illuminates the immediate area on opening your door. 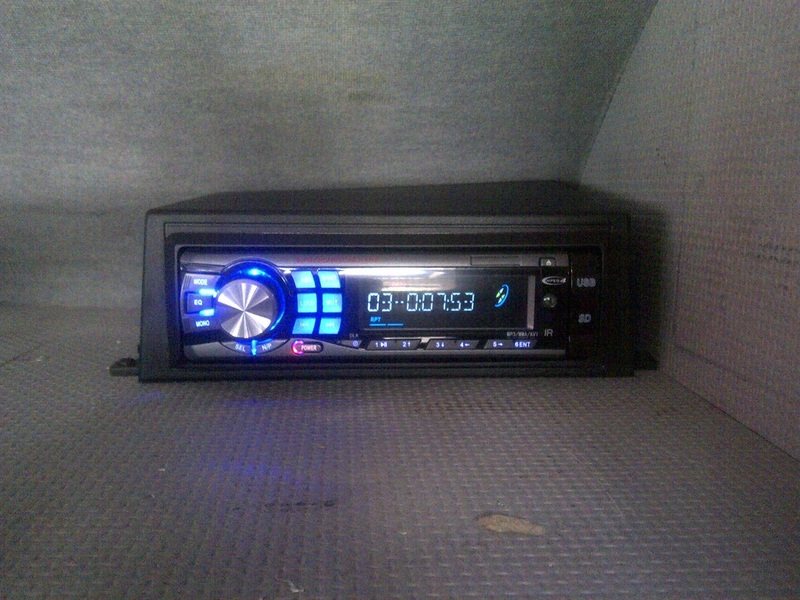 Custom installed & bespoke to your vehicle. 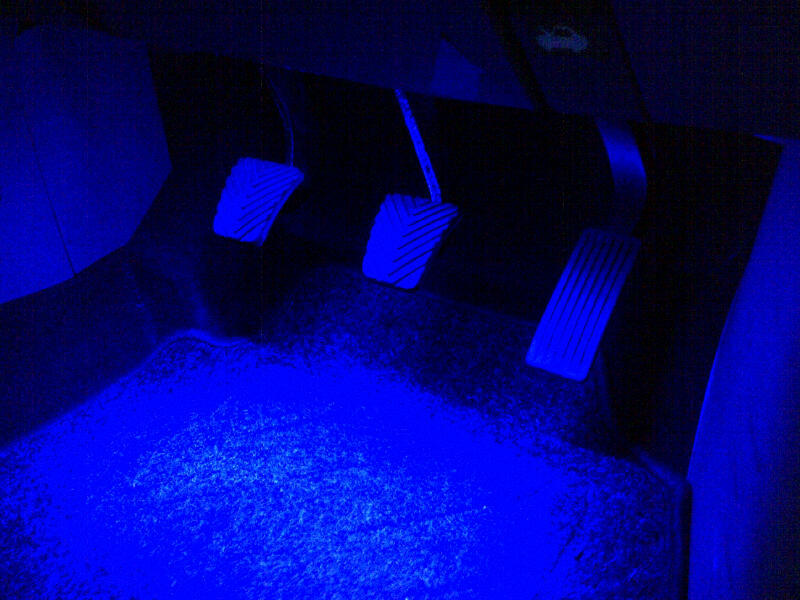 Why not add some coloured mood LED lighting? Our Snap On Tools Dealer approached us as he was suffering problems with his auxillary batteries going flat halfway through the day espeically during the winter months. We discovered that with his old lighting system he was drawing 12A from his aux batteries and due to the stop start nature of his round was not putting back enough power to recharge his batteries. We replaced all his lighting with LED downlighters, undershelf lighting and strip lights for his computer this reduced the total power draw to 3A. 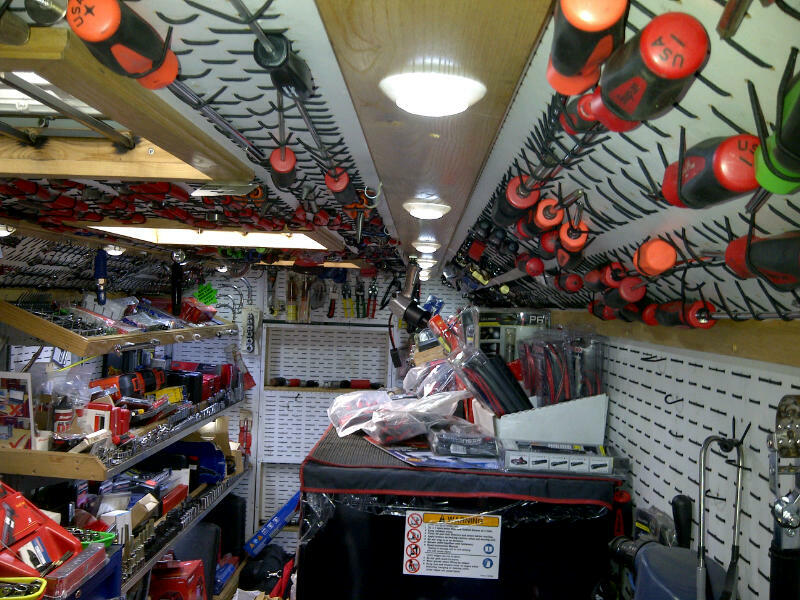 This Winter not only does his aux batteries last all day, his sales area is brighter and more user friendly. Close up of right hand light. 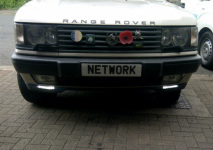 We added Daytime Running Lights supplied by our customer to his Range Rover. They have transformed the look of the front of his vehicle. Close up of left hand light. These pictures show just a few of the most recent jobs and projects we have been invloved in over the last coulpe of months. Watch this space, We are adding more pictures over the coming days. 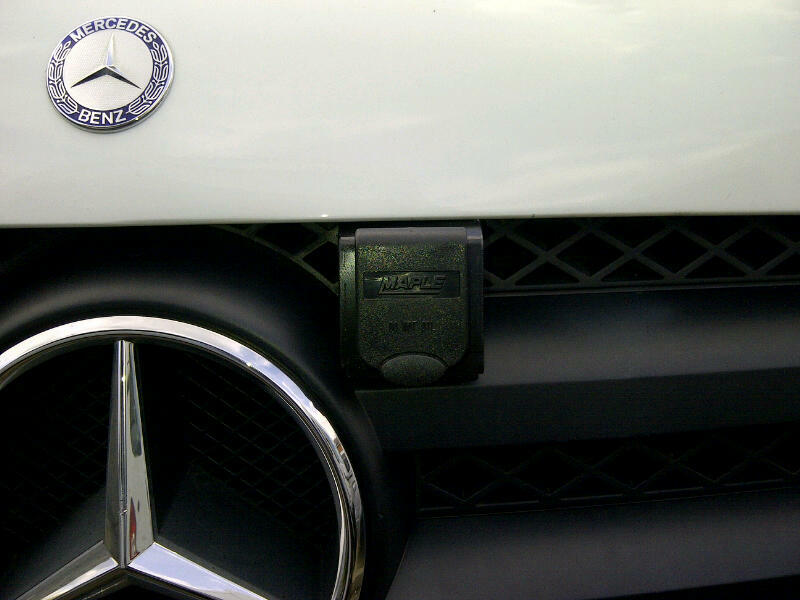 Metal theft applies to vehicles also, we fitted these bonnet locks to our customers fleet of Mk IV Mercedes Sprinters to help protect their catalyst converters targeted by theifs!! After all the electrical equipment was installed the next stage of converting this van into a mobile workshop could begin. 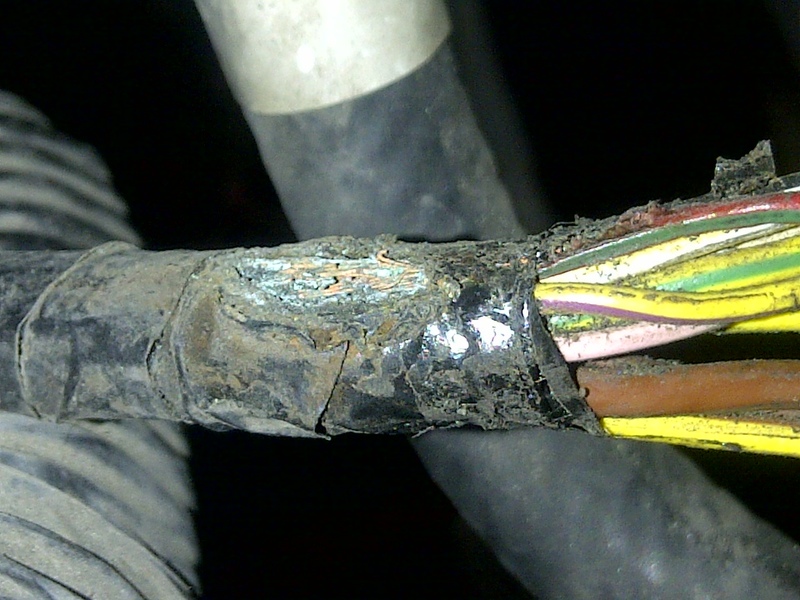 We traced this damaged wiring on a MG Rover engine wiring harness which was causing the engine to hesitate on right and left hand turns. We repaired the loom and cleared the fault codes. Now it runs like new again. 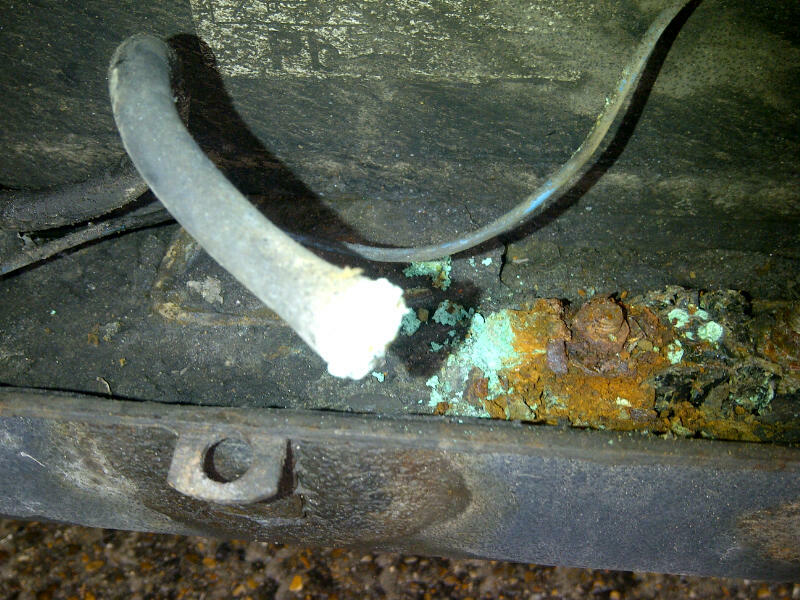 This Ford Focus Zetec had a bad misfire after the owner carefully washed the engine!! 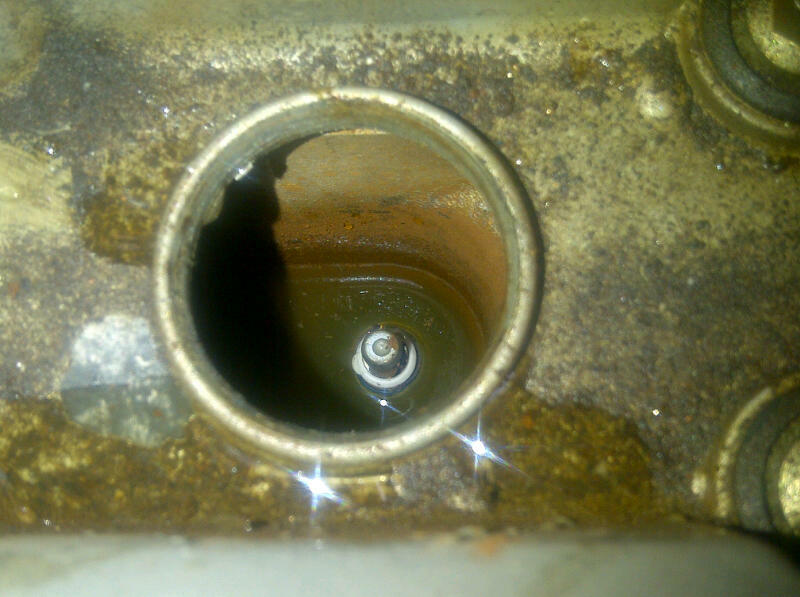 We removed a coulpe of litres of dirty water from the spark plug channel in the cylinder head and advised the owner to use a touch less water next time. Now the engine runs fine!! 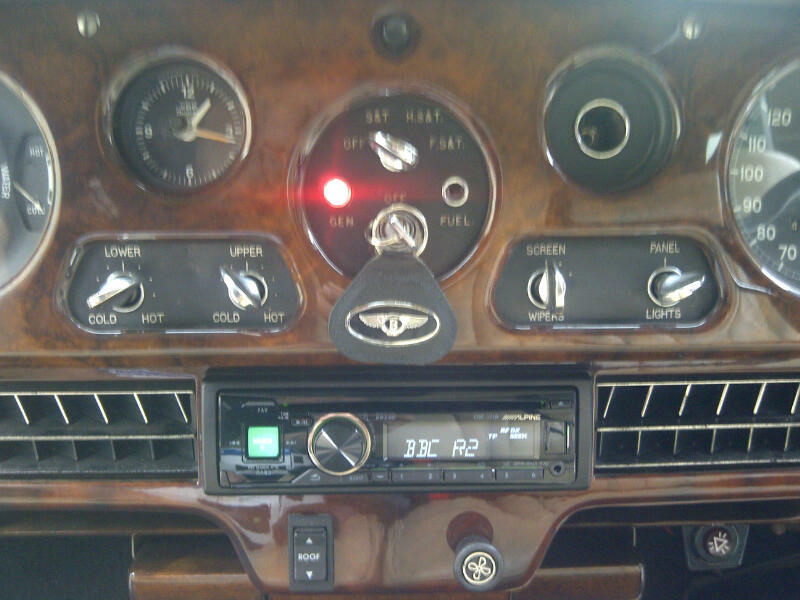 Even a 1953 Bentley S3 can have a up to date modern entertainment system that doesn't look out of place. One of the stranger projects we have undertaken. 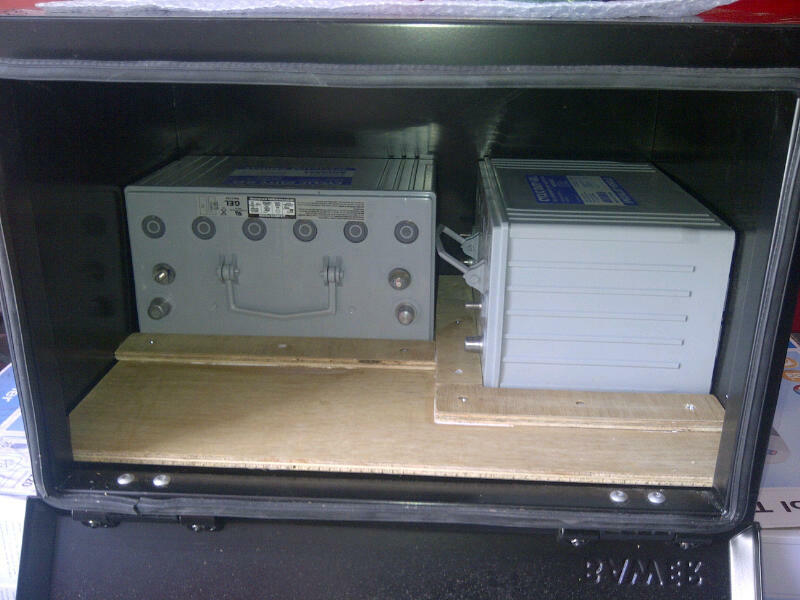 We installed a split charged extra battery and 12v power outlets. This HGV lost the use of it's tail lift whilst on deliveries. We located the fault, cleaned out the area of about a Kilo of dirt and gung, fixed the hole in the battery box lid, replaced the corroded wiring and fusebox and sent them on their way. 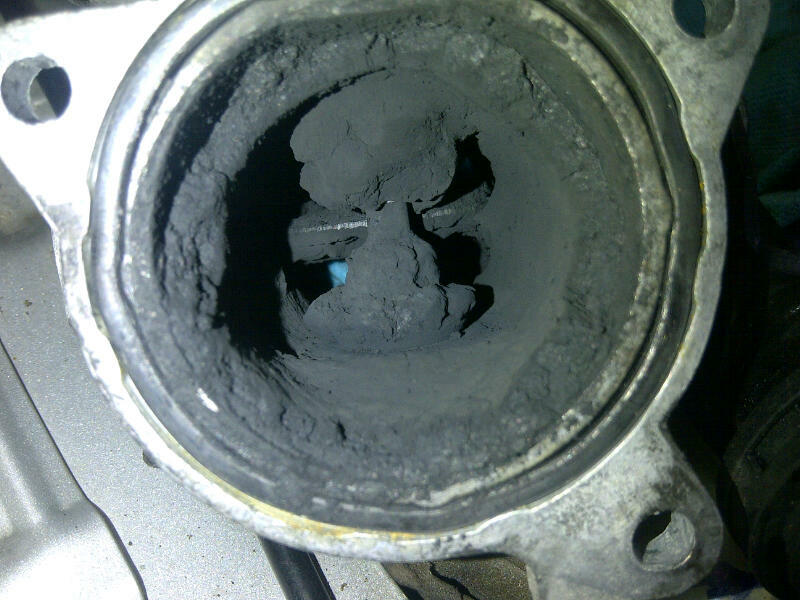 This Blocked EGR Valve on a Skoda Diesel was stalling the engine and affecting the engines performance. We cleaned it out and now the car runs like clockwork. 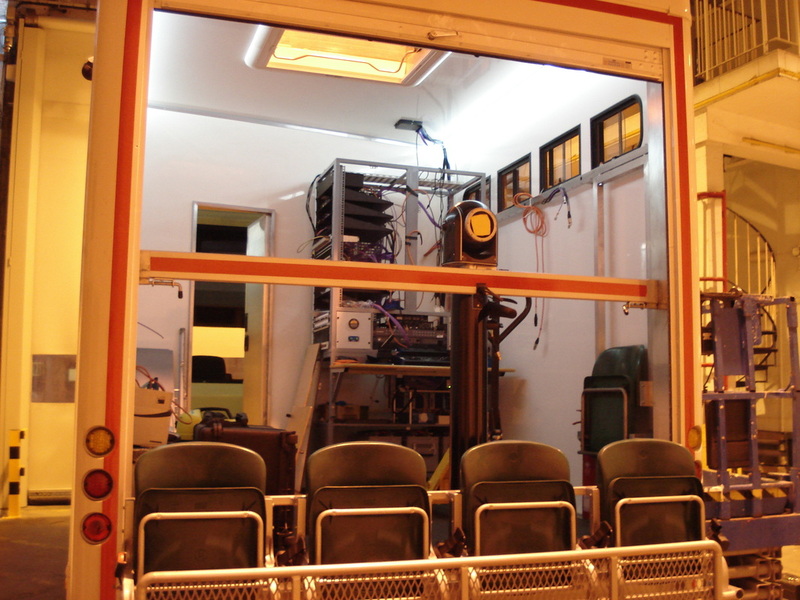 Rear filming platform and seating for cameramen and journalists. 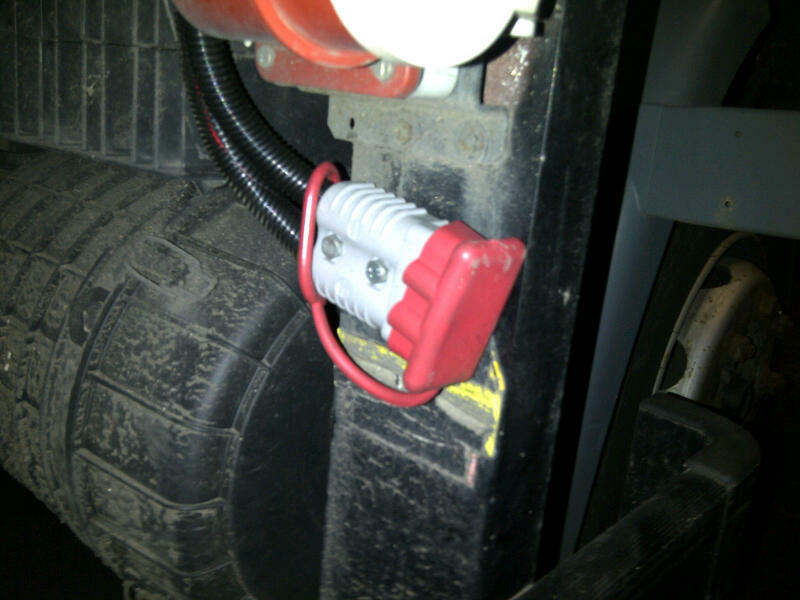 Adding a simple charging/jump start point to your HGV can save you time and in the long run money. Need extra batteries? No problem. 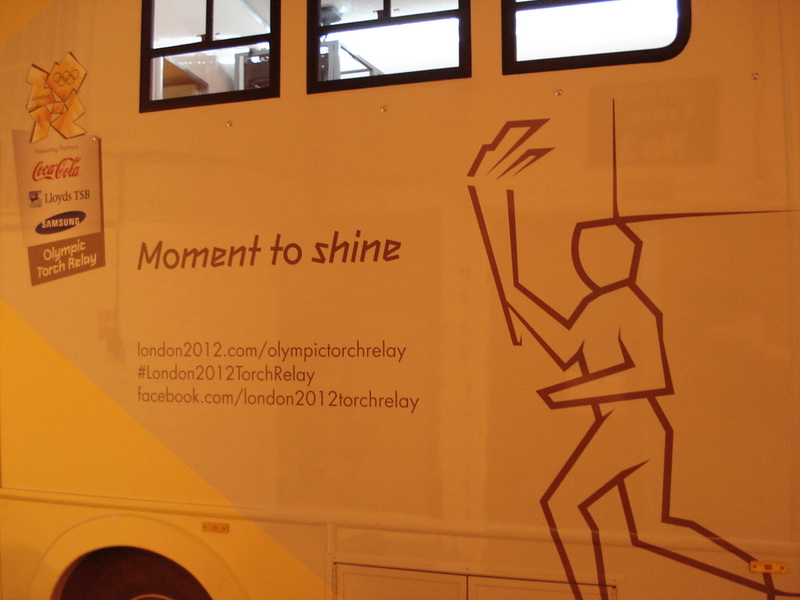 In early 2012 we were asked by one of our suppliers to install various pieces of electrical equipment that they manufactured into the Olympic Torch Relay filming vehicle (pictured above and left) and a additional support minibus that travelled in front and filmed all of the relay runners around the length and breath of the UK. 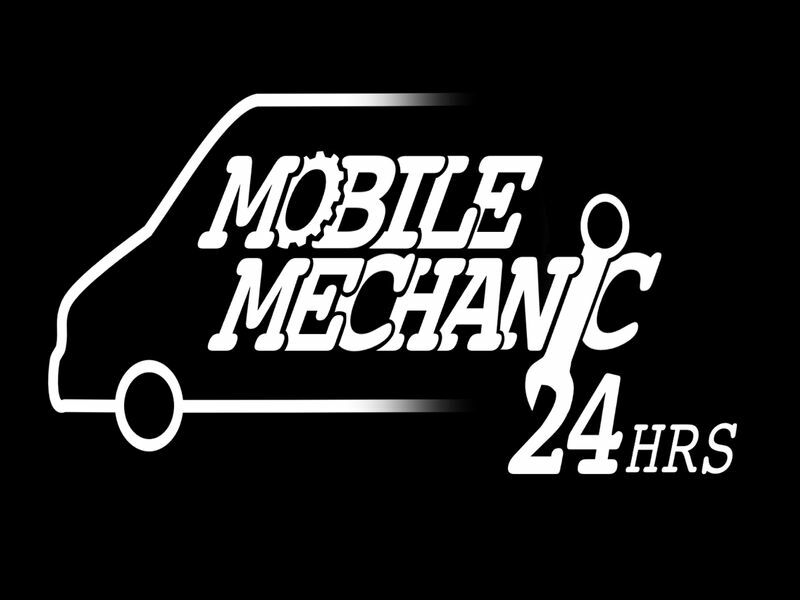 Its time for a new service van/mobile workshop for MobileMechanics24hrs. 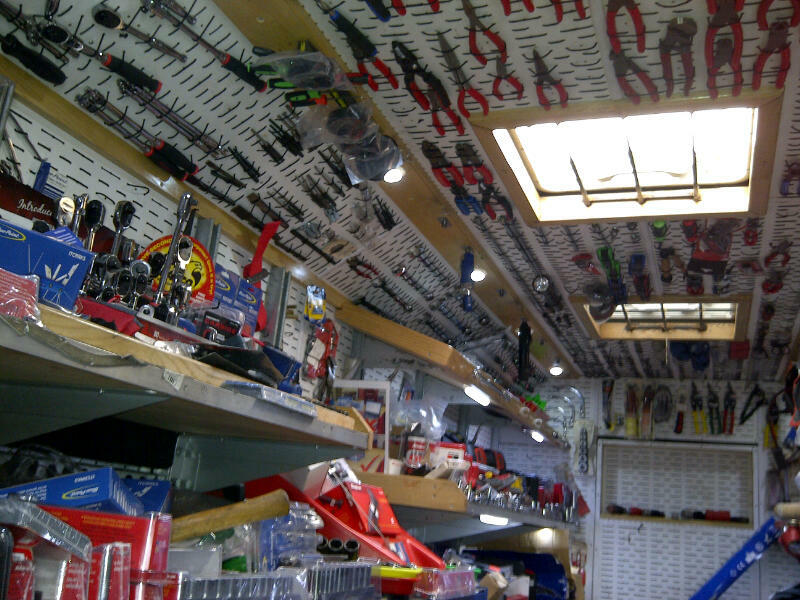 Having worked on their last vehicle we got the call again to install all their old equipment and some more new stuff.